"These mushrooms are delicious on their own, or put them on toasted sourdough bread with Dijon mustard for a great veggie sandwich. Use a mixture of chopped fresh Italian herbs (oregano, basil, thyme, and parsley)." Soak sun-dried tomatoes in a bowl of hot water until softened, about 20 minutes. Drain. Rub the caps of the portobello mushrooms with 2 tablespoons olive oil, or as needed; arrange mushrooms gill sides up on the prepared baking sheet. Season mushrooms with oregano, sea salt, and black pepper. 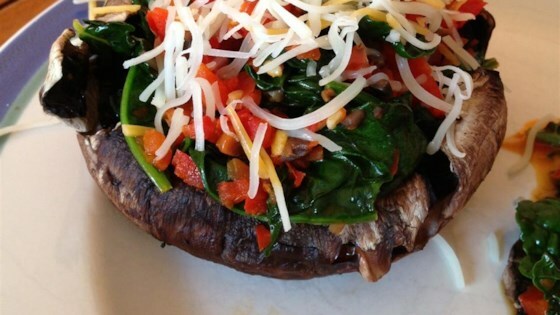 Bake mushrooms in the preheated oven until tender, 8 to 10 minutes. Place the mushroom stems, sun-dried tomatoes, red bell pepper, and garlic cloves in a food processor; pulse until finely chopped. Heat 1 tablespoon olive oil in a large skillet over medium-high heat. Cook and stir sun-dried tomato mixture in the hot oil until fragrant, about 2 minutes. Stir spinach into the skillet; cover, reduce heat to medium-low, and cook until spinach is wilted, about 3 minutes more, stirring occasionally. Drain excess liquid from skillet. Spoon spinach mixture over baked mushroom caps. Divide diced avocado atop stuff mushrooms and sprinkle with Parmesan cheese to serve. For sandwiches: Spoon spinach mixture over mushroom caps and top with avocado and sliced provolone cheese. Put between 2 slices of toasted sourdough bread spread lightly with Dijon mustard. Add a little goat cheese in the spinach mixture for a tasty, protein replacement meal. We love this recipe!! I usually serve it over white rice, and sometimes use guacamole instead of just plane avacado on the top for extra flavor. Surprisingly tasty for such diverse ingredients!